Well! Check out this week’s Essex Free Press (Wednesday, December 15th) – I am the feature article on page 3. There are all my books and a very lovely profile – thank-you Andy! I’ve been asked – and now I have an answer! 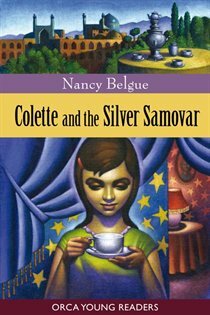 Copies of Colette and the Silver Samovar are available in Kingsville at Kingsville Office Pro at 30 Main Street East. I am still working on my launch party/reading and will give you all the news on that shortly. Hi All! I just shot an episode of “The Storyteller” on local cable (channel 100 for those of you with digital cable) – and had a blast. The interviewer, Tina Wells, called Colette and the Silver Samovar enchanting. Needless to say, I found that a very enchanting thing for her to have said. This is my new book – just arrived this week. I love the cover. And I also love the story! This is my fifth book and my fourth for young readers. I will be hosting a book launch complete with a tea leaf reader, so check back for more details. I got the idea for this book while visiting classrooms throughout the province. Everywhere I looked I saw such a beautiful representation of our cultural mosaic and I thought…I need to write a book about the wonderful diversity of our country. Since I love folk tales, researching Persian folk and fairy tales seemed like an intriguing place to start. So that’s exactly what I did. Along the way I wove other threads into my narrative, like my enduring love of magic and mystery. The result is Colette and the Silver Samovar. I hope you love it! This is my new website. It is currently under construction!